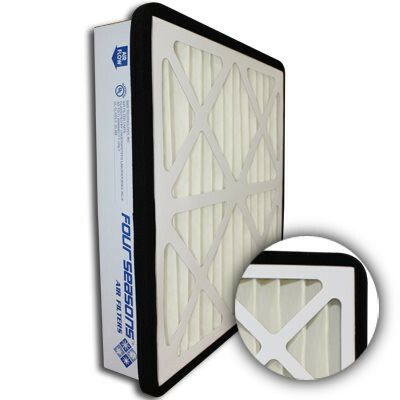 12x24x4 Four Seasons Anti-Microbial Annual Pleated AC / Furnace Filter (MERV 6) | Air Filters, Inc. 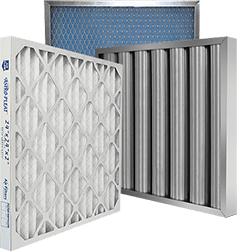 Simply remove your existing filter and replace it with the Air Filters, Inc.™ Four Seasons™ MERV 6 Annual (Up to 12 Months) Expanded Metal Backing pleated Air Filter no tools or modifications is necessary. Antimicrobial air filters effectively inhibits the growth of mold, mildew and other airborne contaminants in the air that greatly reduce the amount of allergens, so you can breathe easier. Micro-organisms, such as fungus, mold spores and bacteria are the smallest and the most difficult particles to remove from indoor air. With out proper filtration of these micro-organisms an accumulation can build up with in the air conditioning equipment and air ducts. By installing antimicrobial air filter you effectivly stop the cycle of recirculating microbes which reduces the opportunities to spread illness or allergies. Four Seasons™ MERV 6 antimicrobial pleated filters are an ideal upgrade from standard disposable panel filters. These filters are designed to last up to 12 months. Air Filters, Inc.™ Four Seasons™ MERV 6 Antimicrobial air filters are treated with a specialized antimicrobial agent that stops microbial growth on contact in addition with 85% Arrestance and 30% Dust Spot Efficiency particle filtration. This filtration technology once reserved medical industry has now been made available for residential and commercial environments. * MERV 6 Antimicrobial annual pleated air filters media is thermally glued to expanded metal backing to prevent the media from sagging during the filter's use. * MERV 6 Antimicrobial annual pleated air filters pleats are formed in a radial configuration to insure proper dust loading. * MERV 6 Antimicrobial annual pleated air filters cartridge is encapsulated in a heavy duty die cut beverage board frame to insure filter integrity in high moisture applications. * MERV 6 Antimicrobial annual pleated air filters face of the die cut is internally glued to the apexes of the pleats to insure maximum endurance under adverse conditions. * MERV 6 Antimicrobial annual pleated air filters media is electrostatically charged. * MERV 6 Antimicrobial annual pleated air filters contain 9 pleats per linear foot which creates a greater surface area to catch airborne particles.